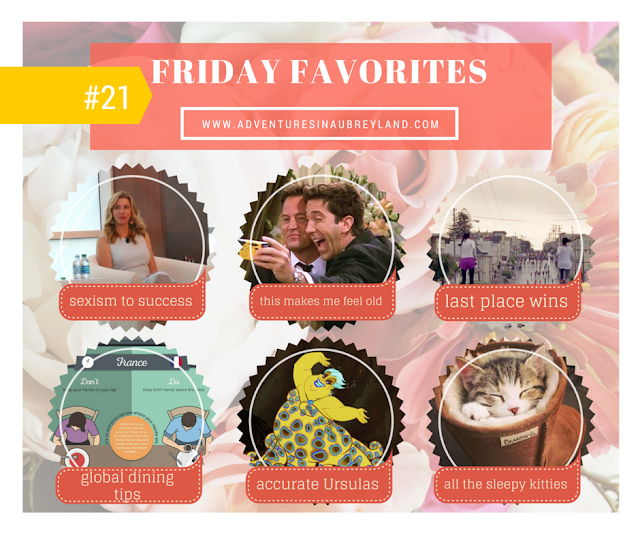 I'm trying a new format with my Friday Favorites, so you scroll less... and hopefully enjoy more! From Sexism To Success: Lessons From Spanx's Sara Blakely, Ivanka Trump And More. I love this article because it highlights some very real sentiments and experiences from successful women. I was initially surprised when I found out my MBA program was only about 1/4 women, but now when I read anecdotes like these they no longer shock me. 17 Things in "Friends" That Aren't Even a Thing Anymore. Remember disposable cameras? Be prepared to feel old. Yikes! Nike: Last. I love this video from Nike paying homage to ALL runners, not just the ones leading the pack. As I've been struggling to find motivation to run, this is a nice reminder. "Anyone can be a runner. All you have to do is start running." 10 International Dining Rules Every Traveler Should Know. These are great if you're uncertain about different dining customs as you travel globally. When I studied in France, I had to force myself to put my hands/wrists on the table vs. in my lap! And while it's not listed, I remember as a kid in Korea being mortified when people would lightly belch at the table towards the end of a meal, only to learn it's polite there as a way of showing your host how much you enjoyed the food! This Is What Ursula Would Look Like If She Lived In Different Ocean Environments. I love the intersection of art, nerds, and Disney. So this collection of images of what The Little Mermaid's villain Ursula might look like if she was an octopus in various ocean environments, I thought it was really cool! 15 Photos Of Cats Too Tired To Care Where They Passed The Hell Out. Because the struggle is real, and any one of these could be my cats. On the Blog: I was initially a little nervous to post this review of THINX period underwear on my blog, but I do like to try new items/services and review them candidly here. It took a little courage to post! The THINX post hasn't driven a ton of commentary on Facebook (given the subject matter) but it has been viewed a lot of times. So I'm sharing it again here, as I think people are curious! Instagram: I've been doodling a lot in my planner, and this image from the aftermath of Black Friday and Cyber Monday still makes me giggle. Shopping Wishlist: I sold my last pair of Hunter boots on Poshmark, because the shaft was too narrow for me. I've had my eye on their adjustable back pair, and I'm thinking it might be my birthday gift request for March.